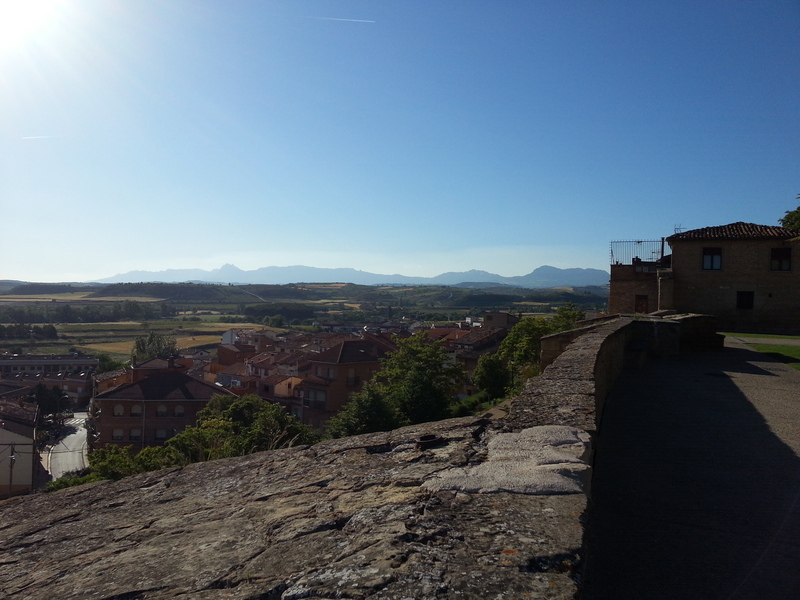 This post is about the 3rd day of my Camino de Santiago Pilgrimage by bike. It happened on the 27th of May 2015. 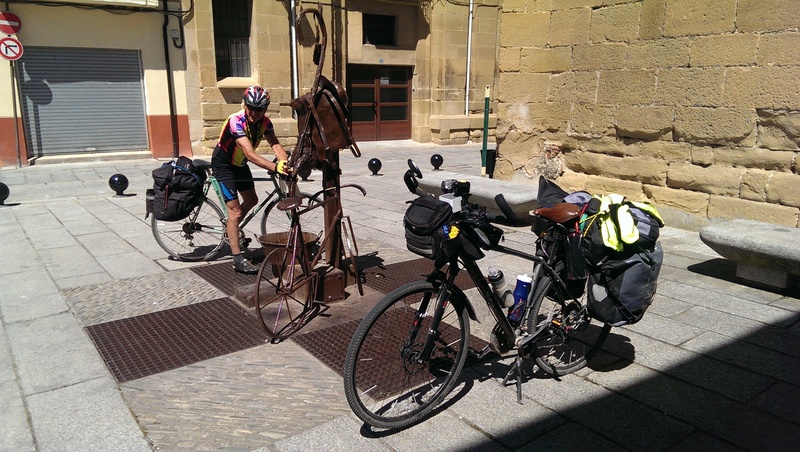 We´ve done this stage of 63.67 Km from Puente la Reina to Viana in 8h and 11m, of which 4h 55m were of moving time. As we were getting our bikes ready to leave the hostel we met Paula from Brazil. 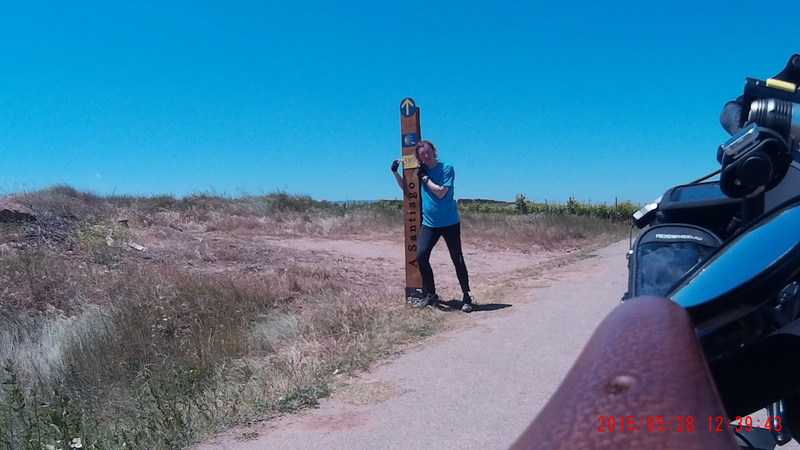 Paula was also cycling the Camino, but having started from the Notre Dame cathedral in Paris she was already on the road for much longer than we were at that point. 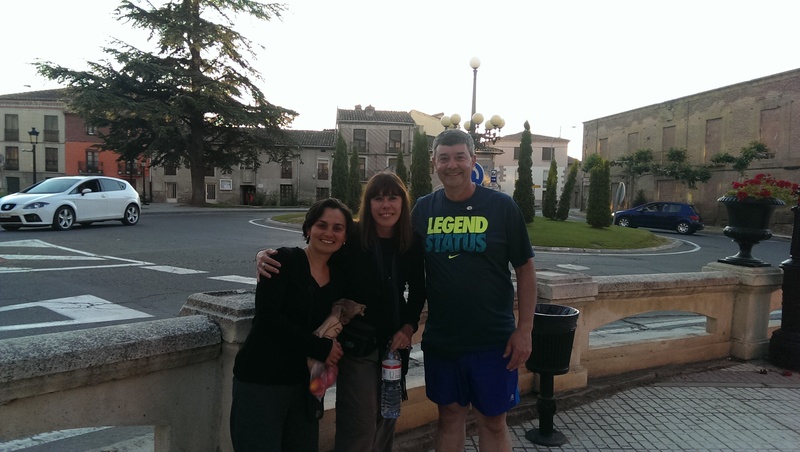 We met Paula along the way several times this day and thereafter all the way to Santiago. 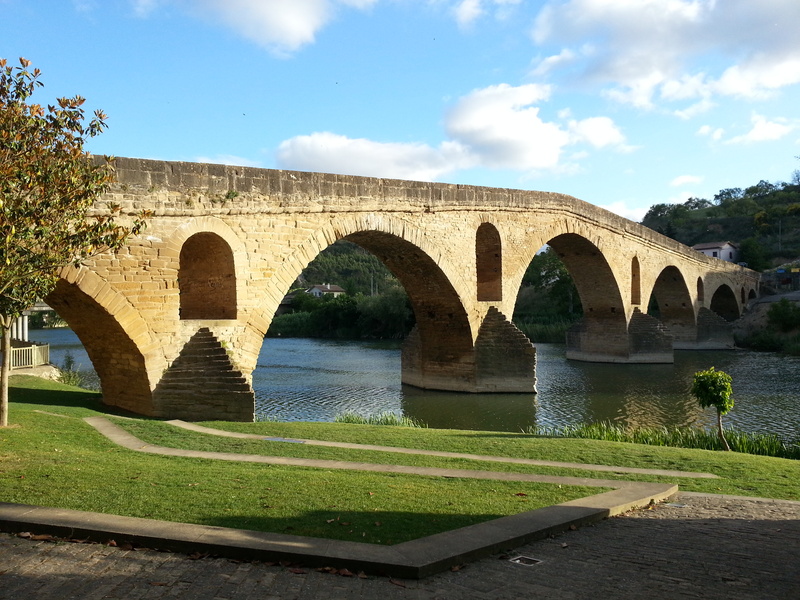 We left Puente la Reina around 7:40am, not quite sure where we were going to stop. Weather improved significantly as you can see and we had a wonderful sunny day all day. Like in previous days, we left the hostel without having had breakfast. 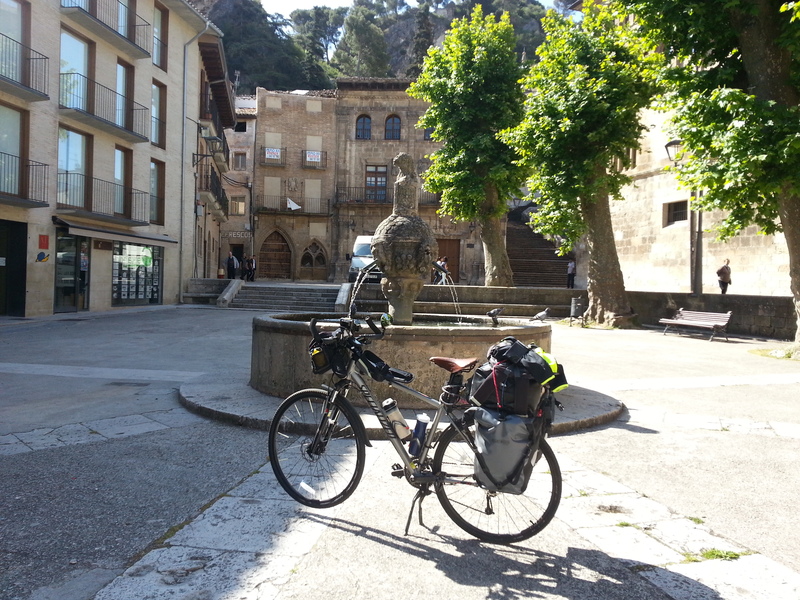 We stopped for breakfast 47 min later at a little village called Cirauqui about 10 Km away from Puente la Reina. 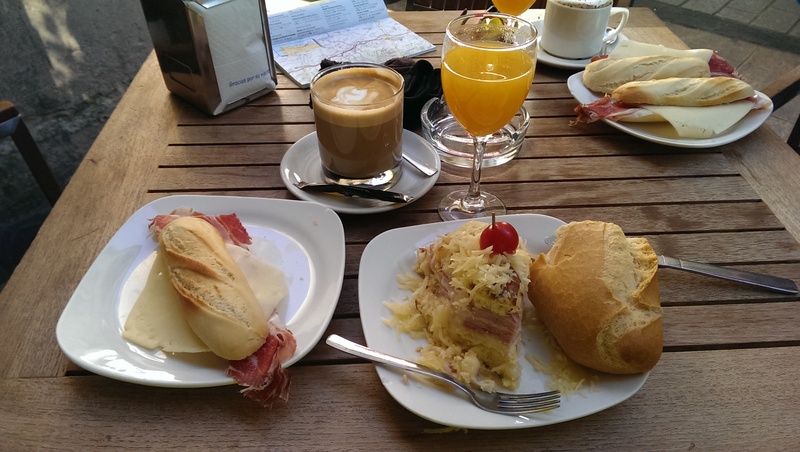 One thing I learned pretty quickly is that in Spain Breakfast is not a big meal. People typically only have a cup of coffee with toast and one or 2 pastries. 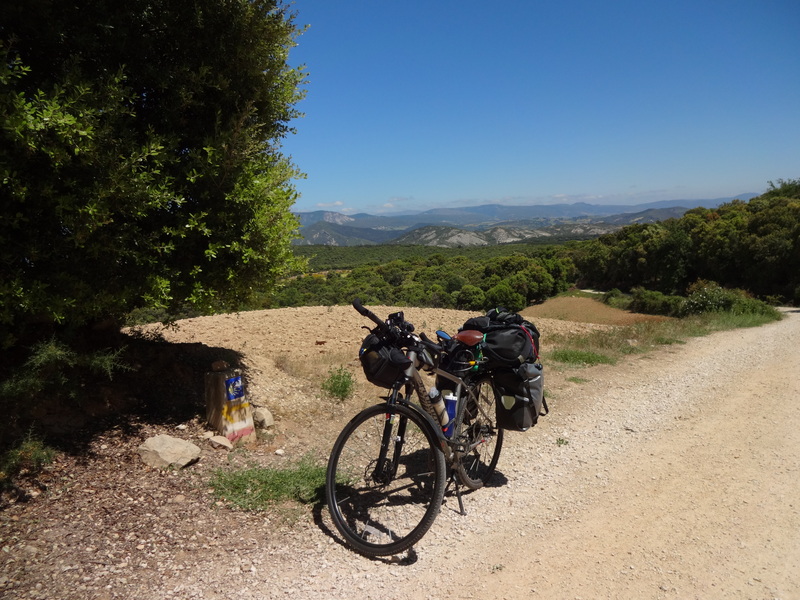 My strategy was, however, to eat only once during the ride and then have dinner in the early evening after the day´s ride. 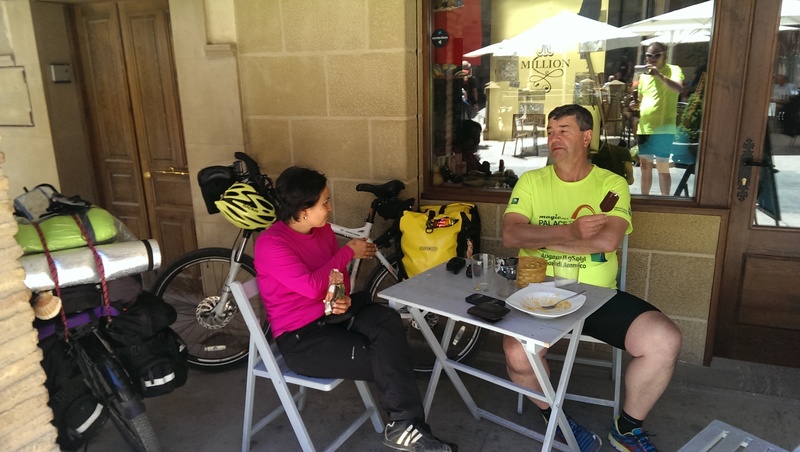 I don´t like to fill up with food in the middle of a bike ride. I feel heavy and drowsy and don´t perform well. After breakfast we continued on the NA-1110 which was the road we stayed pretty much all day, with the exception of the 10Km I rode by myself following the walker´s path after Irache, but I am going ahead of myself. 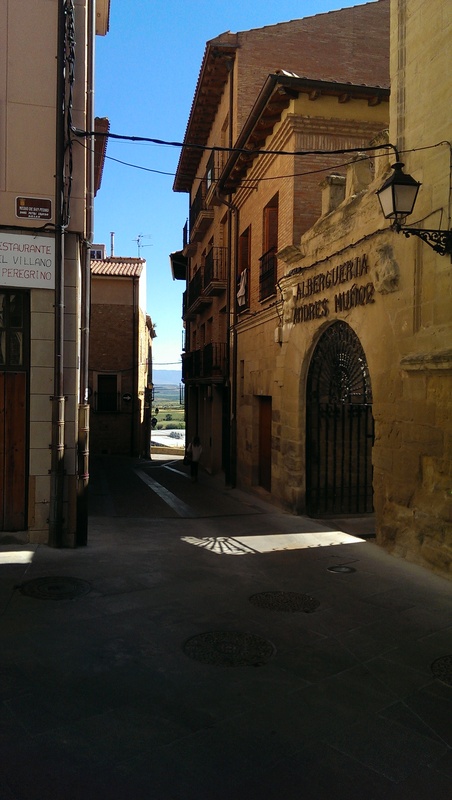 As we arrived in Estella and crossed the river Ega we decided to enter this historic town for a quick look around. Few moments later Paula arrived there also and we took a few pictures together. 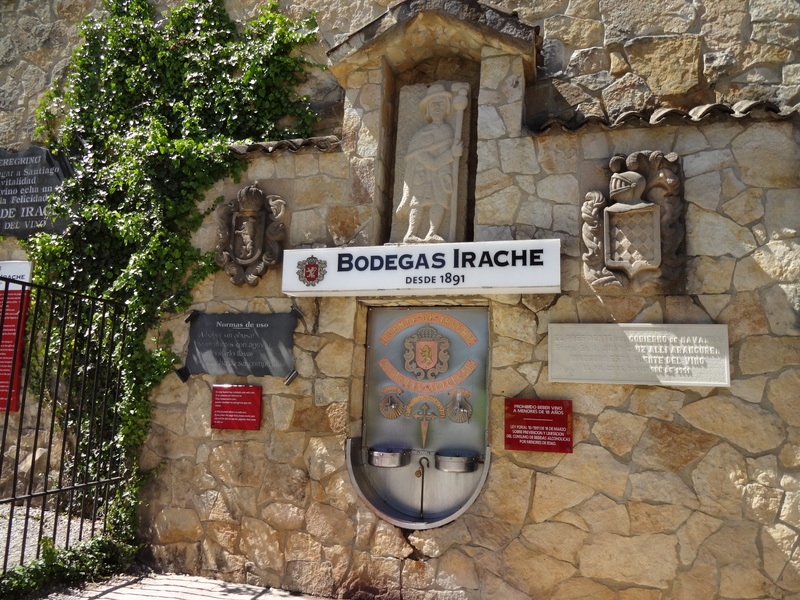 Not long after leaving Estella we arrived at another known pilgrim landmark on the Camino: The winery known as “Bodegas Irache” with its famous wine fountain. 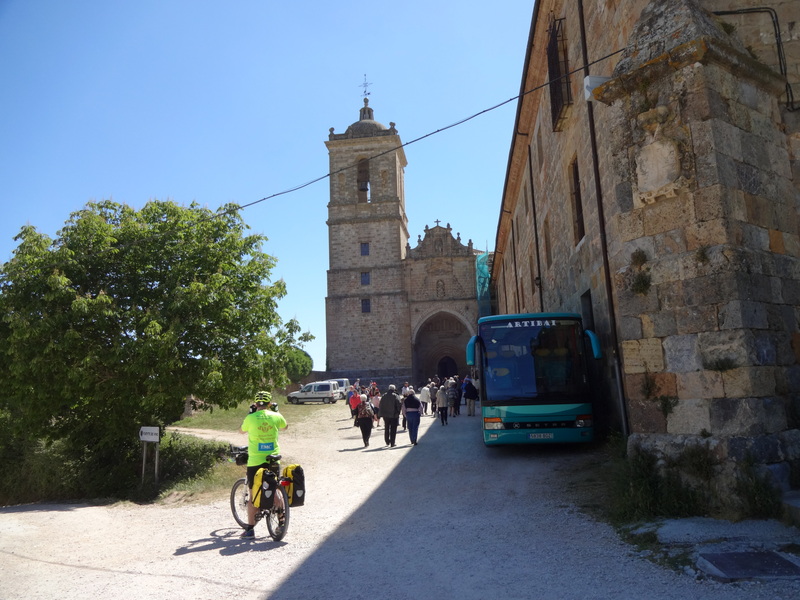 It lies right beside the Irache Monastery witch is also a Camino landmark and served as a hospital for pilgrims for many years having been also a pontifical University, between 1615 and 1824, the first university of the kingdom of Navarra. 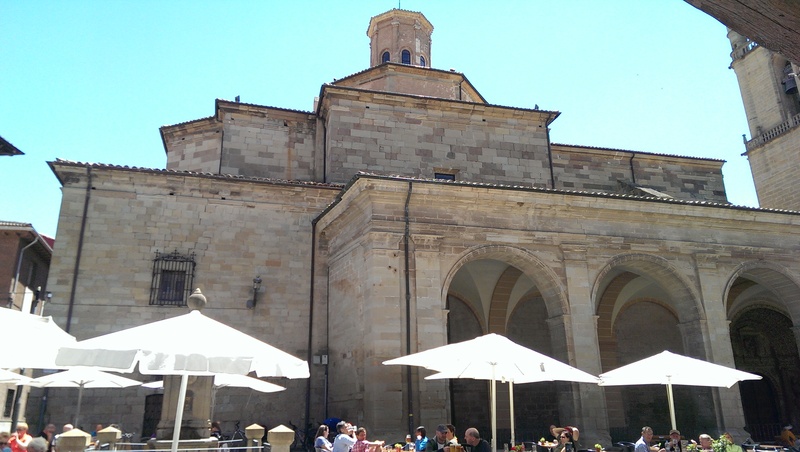 Although it´s called a fountain, wine does not flow continuously. Like in modern water fountains, you have to press a button for the red wine to flow. Wine comes out at natural temperature. It wasn´t really to my taste. This place is usually crowded with people trying to taste the wine and take pictures or selfies of themselves at the fountain. 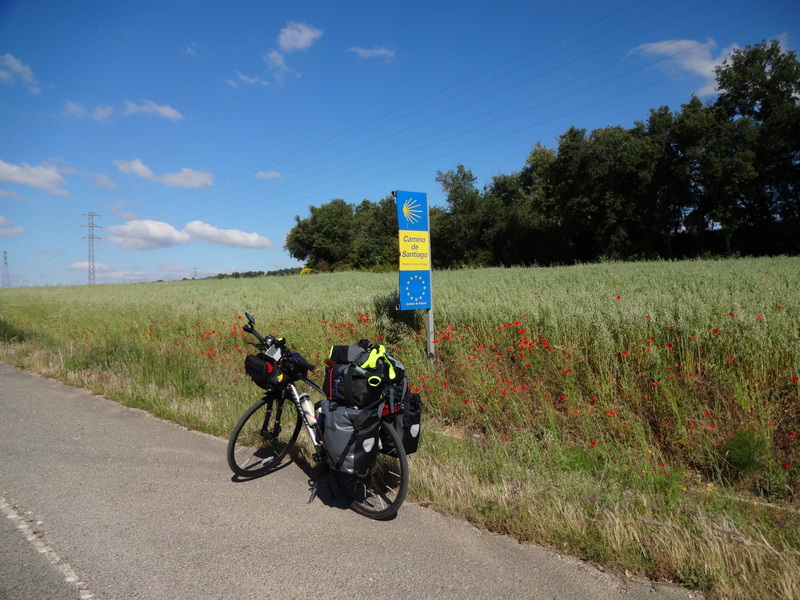 After Irache, I was keen to experience the same paths as the walker pilgrims do, so I decided to take the walkers path and Fernando continued on the road. 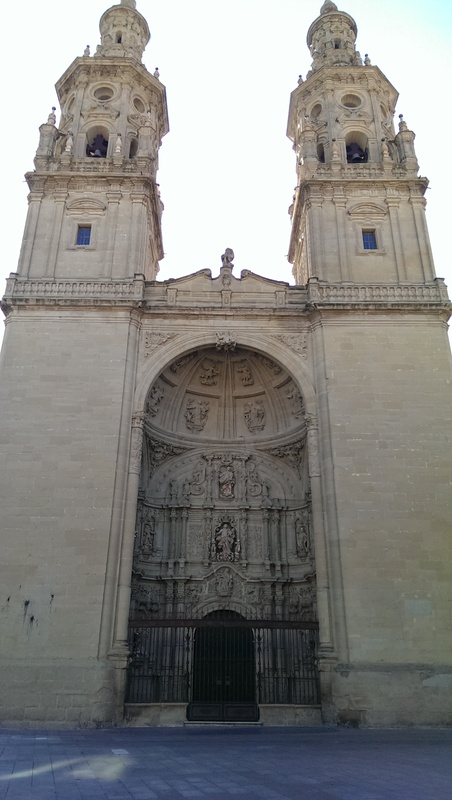 We agreed to meet in Los Arcos later that day. This was the most challenging ride of that day. 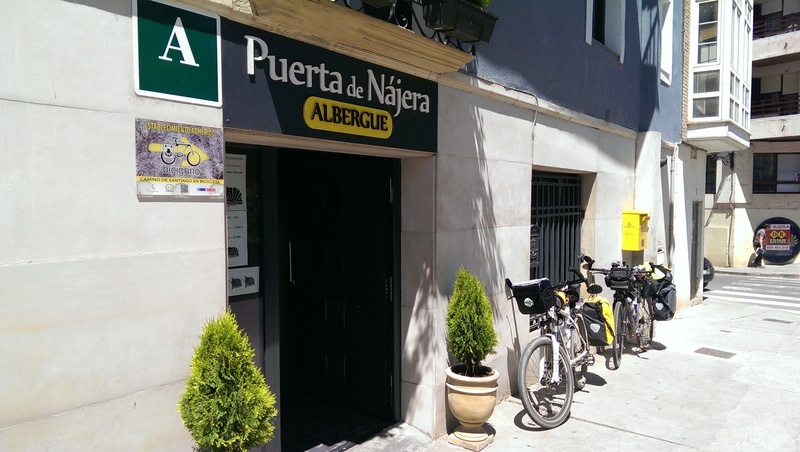 Please read the blog post for more information about this path and make sure that if you also want to take the walker´s path with your bike you understand the consequences. The 1st 2 Km was done through a rather narrow forest path with various degrees of difficulty. Had to push my bike quite a few times because of the boulders and other obstacles along the way. The nice thing was that it was cool as the forest provided a welcome shade from the strong sun. The remaining 8 Km are on dirt roads full of stones, sand and generally difficult to ride. 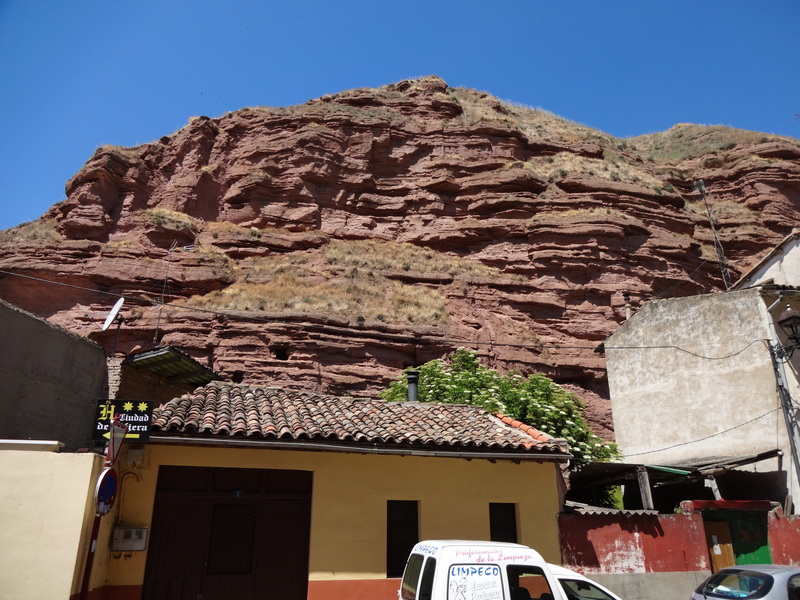 Unfortunately most of it is upwards leading to a heights of above 700m in places, which is higher than that of the Alto del Perdón. If like me, you are keen to try the walker´s path with your bicycle, beware of the consequences before you commit to it. 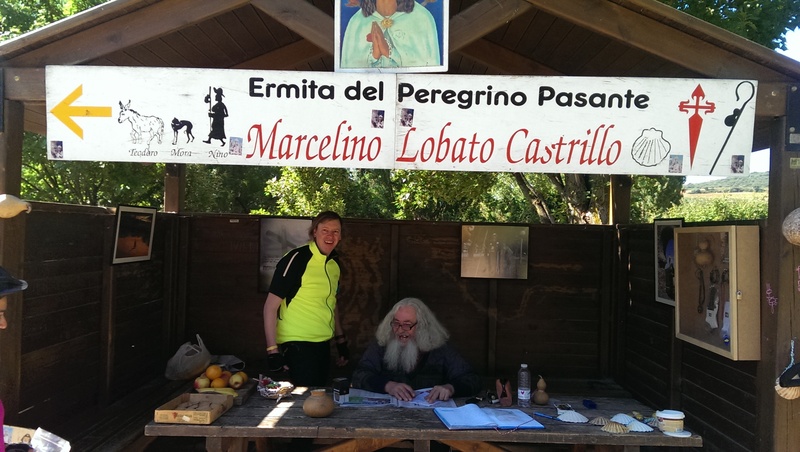 It took me 1.5 h to cover just 10 Km on the walkers´ path to a village known as Luquin were I met asphalt again. Another 1.5 Km and I was back on the NA-1110 and decided to stick to it as I thought I had suffered enough for the day. 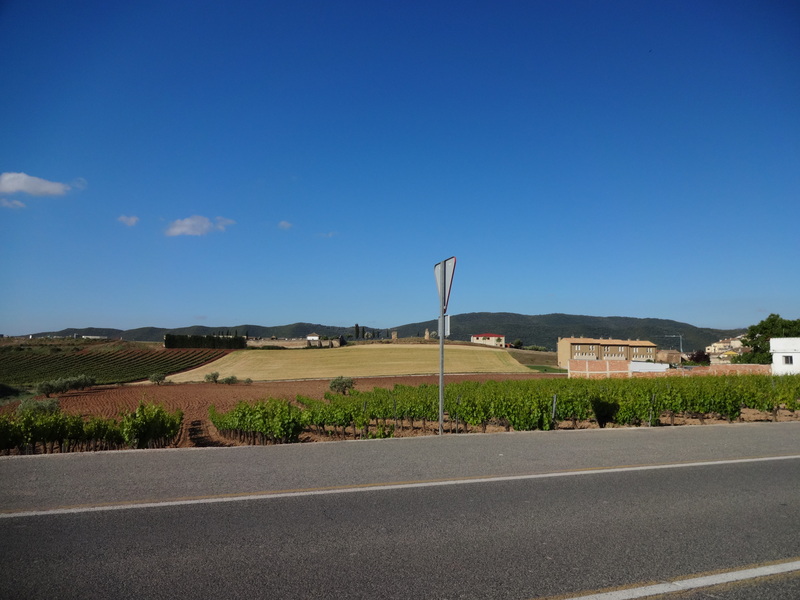 From that point on to Los Arcos was another 10 Km on the road which I did in 35 Minutes. 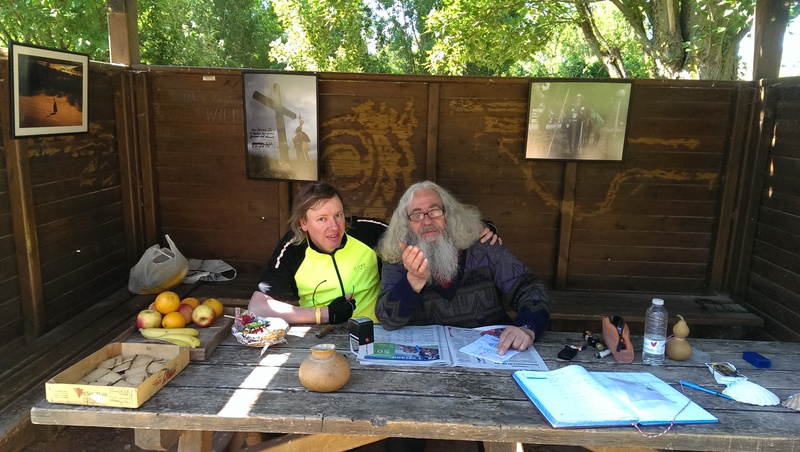 We spend almost an hour there… we ate, we talked, drunk lots of juice and had ice creams. 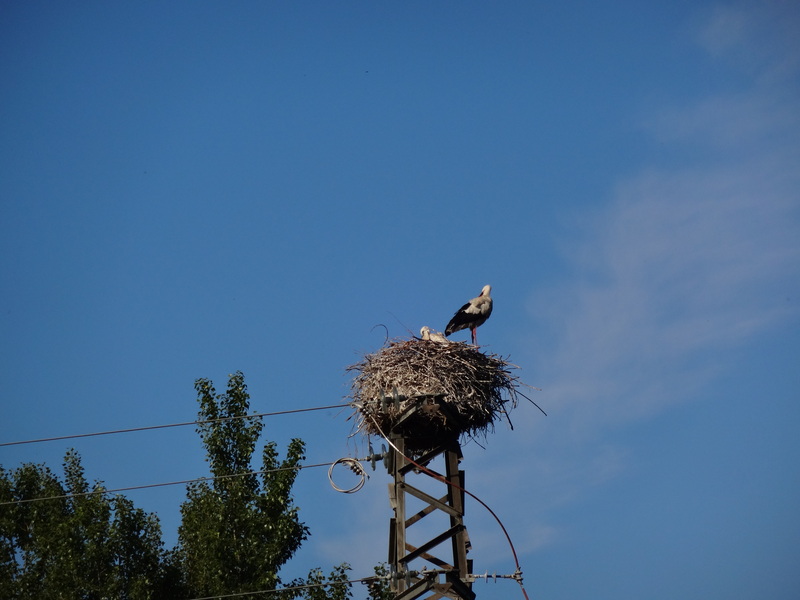 A truly enjoyable moment in the company of an old and new friend (no pun intended). 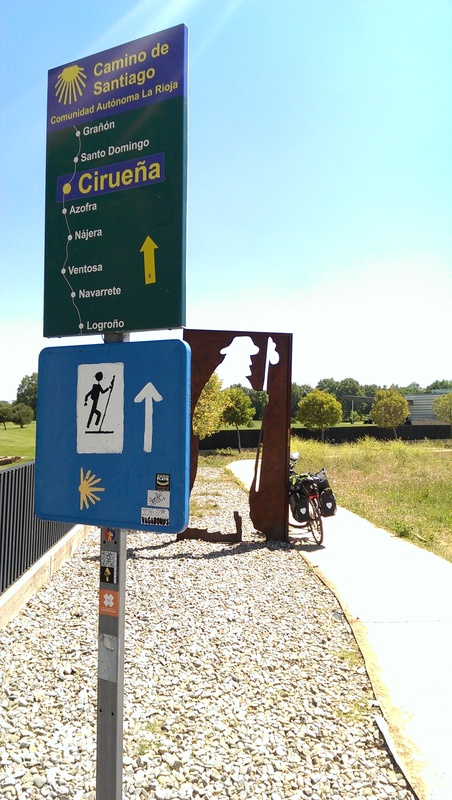 Back on the road again after the wonderful pit-stop in Los Arcos our goal was Logroño, but it was a hot afternoon and the ups and downs of the road to Viana to took a bit of a toll on us. 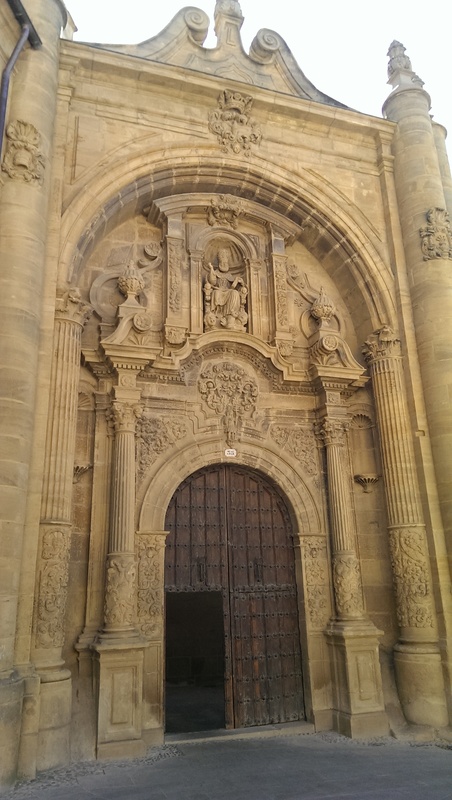 We arrived in Viana just before 5 in the afternoon and the intention was initially just to get our pilgrim credentials stamped. 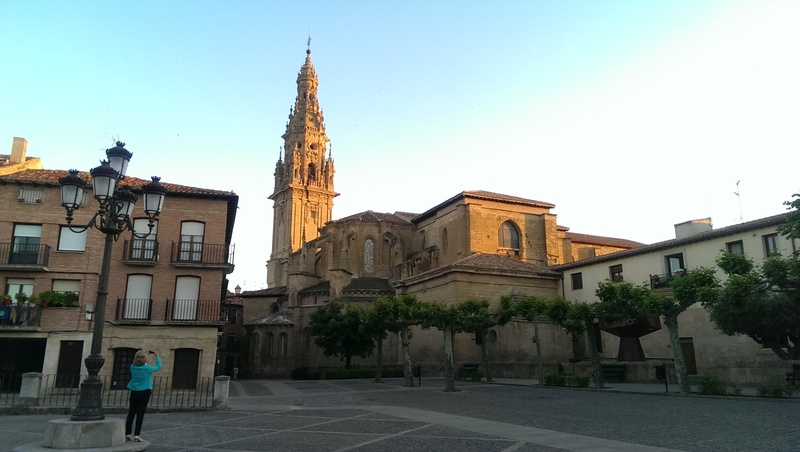 The Tourist Information office was closed until 5:30pm so we decided to stay there for the night. 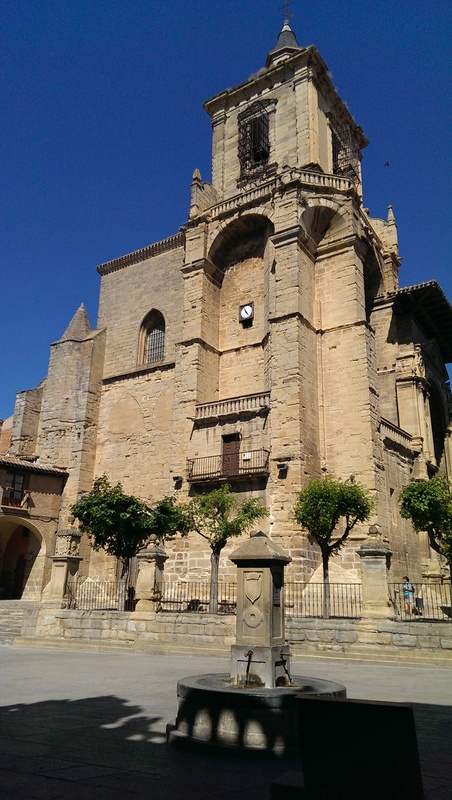 Viana was officially founded in 1219 with a clearly defensive objective against the Kingdom of Castile. 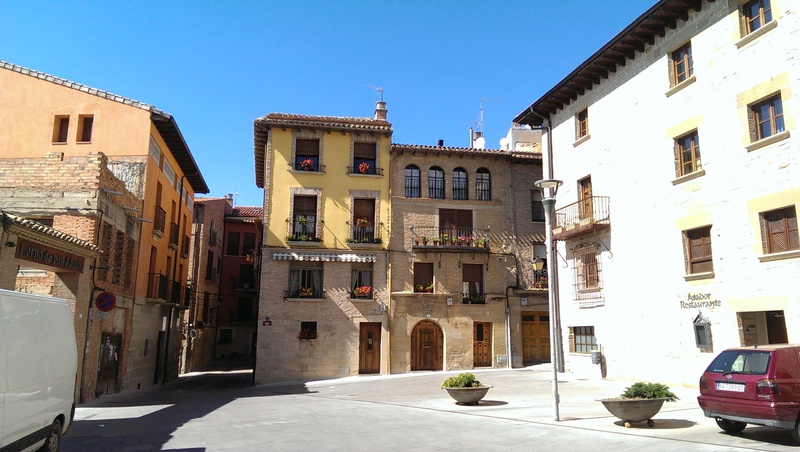 It´s Perched up on a hill and the urban layout is that of a fortified square, with narrow streets surrounded by part of its thick medieval wall. We walked around before heading to the hostel and one of the most interesting thing was the ruins of the Church of San Pedro which collapsed in 1844 due to damaged caused by the 2 wars that happened between 1808 and 1840. 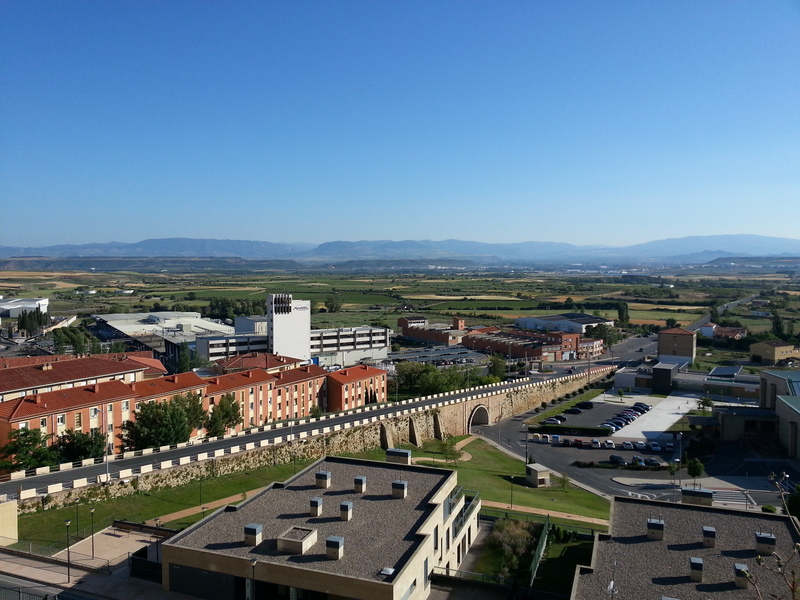 We stayed at the municipal hostel called Alberguería Andrés Muñoz, which was good and wasn´t full. We paid 8€ each for the night. There were several empty beds in the room we slept that night. We stayed in the downstairs´ room after the kitchen / dining room. The room had 4 bunk beds (8 people) and had also lockers that required a 1€ coin to operate. The room had only one or two power sockets as well. Pillows were available, but there were no sheets or blankets. You need your sleeping bag. The bathroom / toilet was right outside the room and it was clean with a good warm shower. The bikes stayed in the laundry room. There were 2 washing machines and a dryer and we took the opportunity to wash our clothes (I think it was €4 for the machine with soap included). There was WiFi available in the hostel and it worked in our room, although signal was weak. dinner I headed straight to the hostel for some internet browsing before going to bed.